To be honest, I had little intention of going. I spent most of that class on MLIA and IWasteSoMuchTime.com (Yes, Mom, that is a real website. No, I didn’t spend all my time on that site…I looked at wedding dresses and comic strips a lot too). *It should be noted that upon mentioning IWasteSoMuchTime.com in this note, I had to revisit the website and accidentally spent 20 minutes looking at bad-pun Valentine memes. Anyway, the point of this was to say it was a coincidence I went at all. The other option was visiting the Czech concentration camp Terezín again and I was not emotionally up for a second round of that. I’ve actually been twice now. The town is beautiful and the many cathedrals are mesmerizing. The Bone Church itself is my least favorite part. The church is “decorated” with the bones of roughly 40,000 people. Early stories suggest that blind monks who took care of the church first began piling pones in geometric shapes. In 1870 František Rint was commissioned to design the bone sculptures inside the church to serve as a reminder of the unavoidability of death. My breath tends to get caught in my throat after several minutes and I begin to feel nauseous and suffocated. As a writer, I don’t ever see skeletons or bones or decorations or symbolism. I see stories. And there are 40,000 stories in that church with empty, polished eye sockets. It’s hard to take in. Eventually, I wander outside to the sunshine and walk around the cemetery until the rest of the party is ready to move on. It does make me think about death, though perhaps not as the architect saw it. 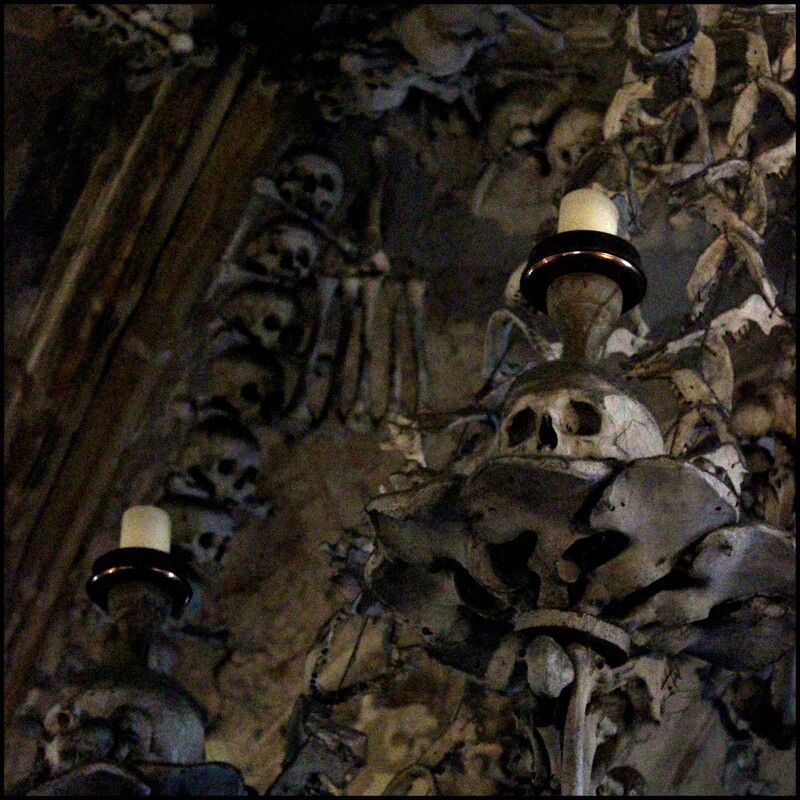 This entry was tagged architecture, Bone Church, Czech Republic, death, Kutna Hora, travel. Bookmark the permalink. This is really creepy. I love churches, but this is pushing symbolism a bit too far for me. I’d want to see the other cathedrals there, please.